Universal voltage regulator and static exciter manufacturer for electrical generators and synchronous motors. Do you need a static or rotating exciter replacement, a technology update to an existing installation, or are you looking for a reliable static exciter for a retrofit operation? Power-Tronics, Inc. designs and manufactures voltage regulators and static exciter replacements for a wide variety of electrical generating systems used in the industry today. Most of our products are in stock and - if not - we have a very short lead time on others. We can also custom-build a static exciter exclusively for your application! Find a Factory Certified Service Technician in your area. Learn more about becoming a Factory Certified Technician. Ruggedly designed for easy installation, setup, and service in the field. We custom manufacture solid state exciters for electrical generators and synchronous motors. Learn about the XR8, the most flexible automatic voltage regulator on the market. Our universal replacement and retro-fit voltage regulators are designed for electrical generators regardless of type, size, manufacture, age, or model. Our varied customer base includes military agencies, industrial applications, utility purposes, and electrical generator repair agencies worldwide. All of our products are designed for a long service life in the harshest environments and if repair is needed, overnight service is available. All of Power-Tronics’ products are designed to withstand the harshest environmental and operating conditions. We use only the highest quality name-brand components in our products and ensure that any ratings are very conservative to allow reliable operation in extremely demanding installations. None of our products require fan cooling or forced air to achieve their ratings. This school is designed to improve understanding of our products, increase awareness of applications, and to provide a wide variety of detailed troubleshooting and training. 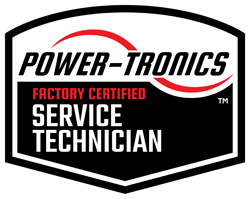 Please click the icon below to access our Certified Service Technician Site. Join our mailing list for new product information and troubleshooting school announcements.